The site looks great, good use of consistent colors. I noticed one thing, the menu is wonky in Safari (works good in Chrome and Firefox). It’s hard to get the submenus to show. And often it gets reloaded when you click something and it animates again… arrrrghh. Yeah I see that too in Safari. What version of Blocs did you use to build and export it? I exported it with the latest Blocs version. When I create a standard nav with dropdowns I don’t get this effect at all and it works fine in all browsers. I’ll take a look at the actual code of your site. I cant pine point it down but Im wondering whether the messenger snippet thing you have added is interfering with the menu. Could could try exporting it without that and see if it helps in safari. Actually even without the messenger snippet the issue is there. 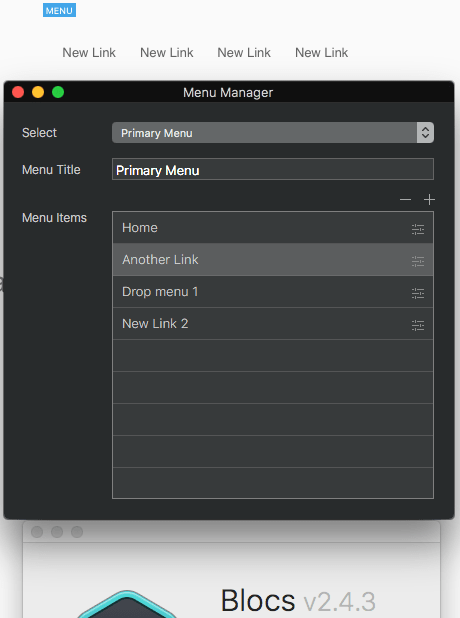 @Norm 2.4.3 and Menu Manager odd behaviour. I added a few menu items, and one that should open another menu but no matter what the preview and exported page only show "New Link New Link… " on the page. I started a fresh project, added the first Hero block and then added the menu items. I deleted the Hero block and added it again and boom… the menu items was now correct. Yeah there seems to be a sync issue. If you set the data feed to none and then back to primary it works. I only seems to get this issue if I use the special menus. Im just making notes now of the issues. Have you minified the export code? I have another ticket with the same problem so its logged as a bug but Im still unsure what causes it, it looks like a class issue to me but not 100%. Just checked your project you emailed me and I deactivated all the custom classes with the dev version of Blocs I use that has extra features to do things like that and the site works fine. So its an issue with the custom classes you added. I’ll keep looking to see which one it is. This subclass has a setting for the active state that centres the text when it is clicked. Remove this by opening this class with the class editor via the class manager, selecting the active state from the droptop to the right of the class name input field and then in the text settings click the X segment under alignment. That fixes the issue at my end. No worries, glad I could help. Very impressive! Where are you hosting this site?